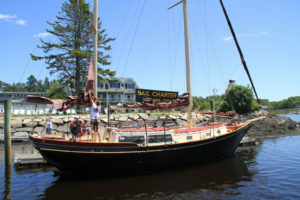 Here in Kennebunkport Maine, that’s how we like to roll, along with our lobster rolls. Picture local school kids and US military marching through Dock Square, a memorial wreath is tossed off the bridge into the Kennebunk River, and we remember those who served our beautiful nation, from this beautiful seaside setting. 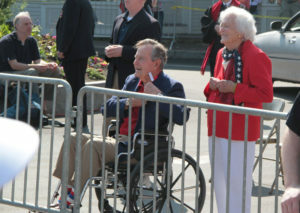 And yes, President George H W Bush (#41 as we call him here in Kport) and Barbara Bush were often in attendance for Kennebunkport’s parade. Weather rarely dampens this town’s spirit. If you have never witnessed the Kennebunkport Memorial Day parade, I say it’s a must that you muster for this show of patriotism Monday morning of Memorial Weekend. 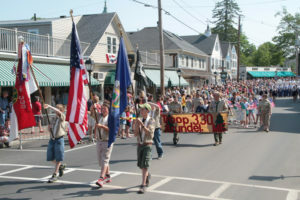 The Kennebunkport Memorial Day parade takes place Monday Memorial day end of May at 9:30 a.m. in Dock Square. 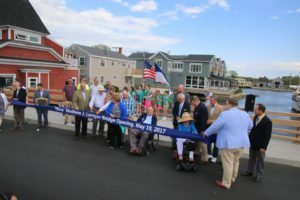 Folks start lining the streets by 9am from Kennebunk’s Lower Village HB Provisions to the Clam Shack and Ports of Italy, across the Mat Lanigan Bridge (which celebrated its official debut Friday May 19 with the Bush’s in attendance). Dock Square is packed with local people, folks from away, snow birds back for the summer, and dogs sporting flag bandanas. It’s a picture postcard for patriots. Memorial Day Monday afternoon, we recommend a reflective walk on Kennebunk Beach, a bbq or a live band – The Nonantum Resort features live bands, as does Old Vines Wine Bar. 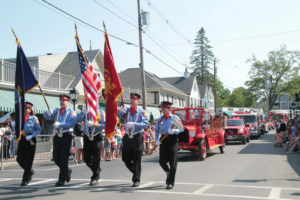 KENNEBUNKPORT: The Memorial Day parade will kick off at 9:30 a.m. Monday, from Temple Street and wind its way through Spring Street and down Western Avenue to Cooper’s Corner and back again. A 21-gun salute is held on the Mathew Lanigan Bridge. KENNEBUNK: The Memorial Day parade begins at 2 p.m. Monday in downtown Kennebunk. 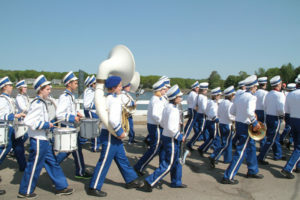 The route takes marchers along Main Street and features the Kennebunk High School band, among others. For Kennebunkport – where to park at around 9:15? Suggest you find parking by 9am! Dock Square is closed to traffic by 8:30am so park on the side of the river you want to go in and out of. Leave a Reply to "Gail Alling"